Did the framer used the same pattern on the elevations. The red squares in the center of the front elevation show this. Starting from the stone foundation, the width of the firebox is also the height to the 2nd floor - the location of the 2nd floor beam. The square above determines the attic floor - the placement of beam at the eaves. The top of the third box is at the height of the ridge pole. Both sides of the front elevation are squares with one longer side determined by the radius of the circle which fits around the square. For clarity I have only drawn the square with its diagonals on the west side and I have only drawn the arc in question, 1/4 of the circle. 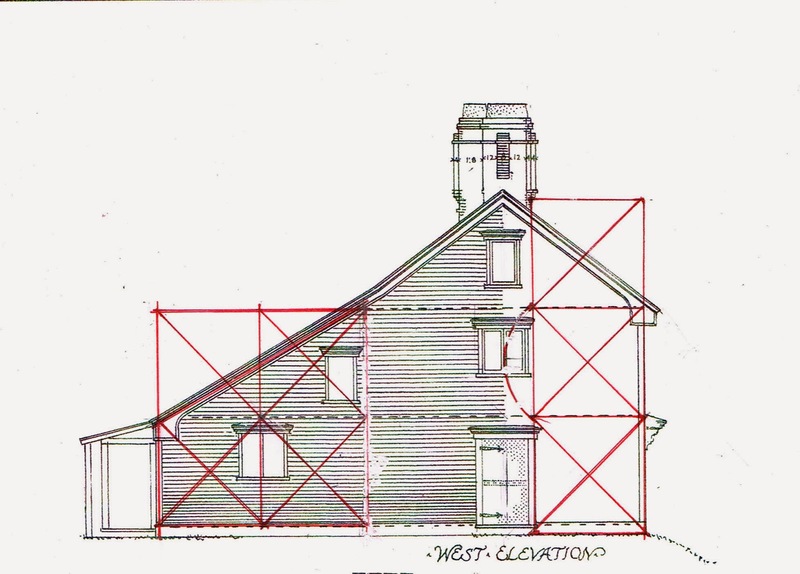 The east and west elevations are identical except that the location of the 1st floor door shown here is the location of a window on the east side. Again the square is the determining geometry. I could have overlaid my red squares in several different patterns which all worked. I chose this one because it shows how the arc hits the center of the window, the center of the original house, and the edge of the square is also the edge of the door frame. The north side of the west elevation is a duplicate, reversed, of the one shown. Again I didn't draw it so that the pattern would be easier to read. This is a geometry for framing. The squares lay out beam and post locations, not necessarily walls and room sizes. 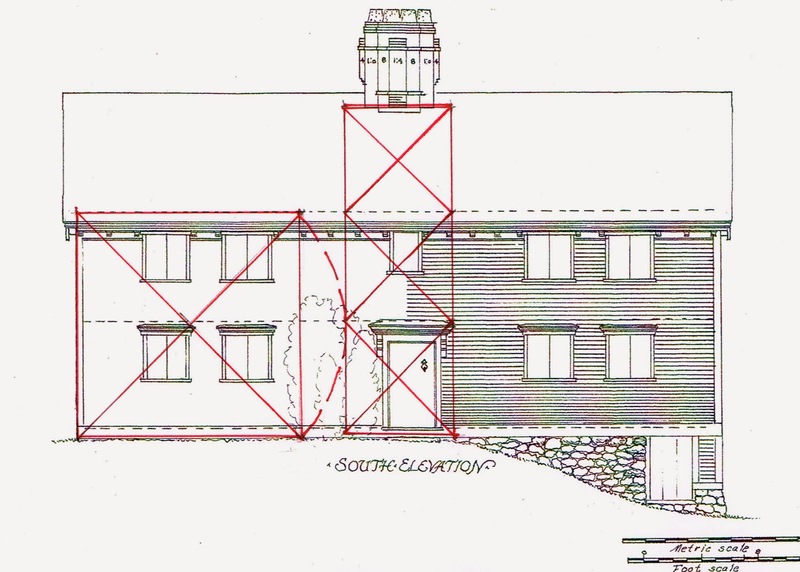 I wondered how the lean-to was laid out, especially since it was added later and its floor plan used the 3-4-5 triangle, not squares, so that the wing would line up squarely with the existing house. 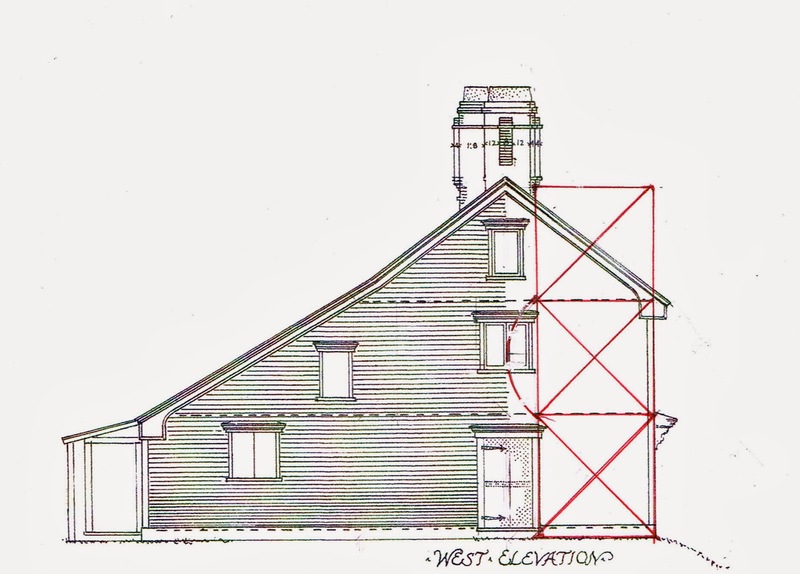 The lean-to elevation is also laid out with squares, but these begin not from the foundation, but from the first floor - which makes sense - it was a given. The roof pitch surprised me because it is so obvious: the diagonal through 2 squares. Given the pattern already established it came naturally and is steep enough when shingled with wood shakes to keep out the rain. Sometimes when I see these patterns emerge I shake my head and look at myself askance, "Of course! What else would have worked so easily?" 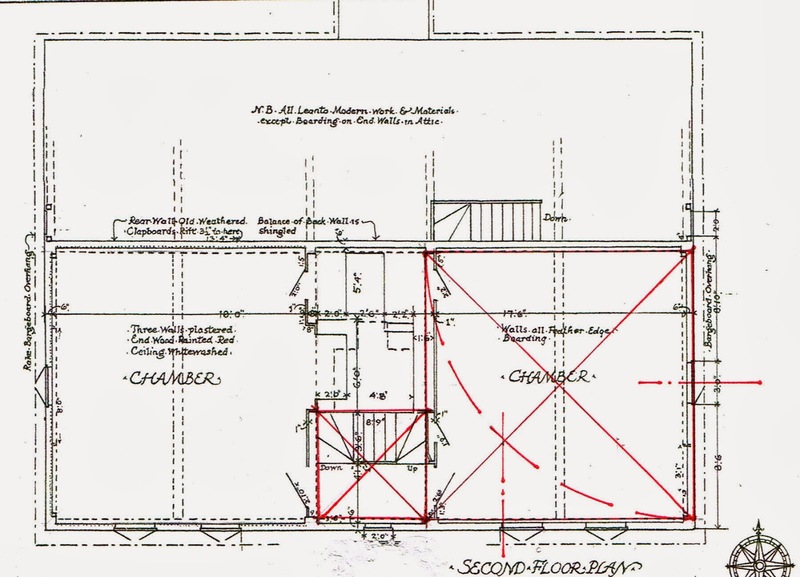 On the second floor plan are dotted lines indicating the exposed beams overhead. Using my calipers I scaled them and found they made a square. They are not the dimensions of the 'chambers' - they mark the outer edges for the placement of the posts and beams. Next, drawing the arc based on the length of the square I marked where the arc crosses the diagonal - the Golden Section. All the windows in the south elevation (except the one above the front door, see Part 1) are placed by the Golden Section. The windows are not centered by the Golden Section as they would be a few decades later. Instead the line marks the side of the window. It tells the carpenter where to start to frame the window opening. Enjoy how the stair hall space within the beams is also a square, although the hall itself is slightly wider as the walls have been placed on the other edge of the beams.